With much of Australia facing the worst bushfire conditions in 40 years according to the Rural Fire Service, land and vegetation clearing to create much-needed firebreaks is already underway in many parts of the country. While back burning is the preferred method, it’s not always possible, making Digga Australia’s Mulcher an ideal alternative. The Digga Mulcher is anhydraulically driven attachment suitable for use with high flow skid steer loaders and excavators up to 20 tonnes.It can clear tall weeds, heavy brush and hardwood trees up to 8 inches (20cm) in diameter. “Back burning is only undertaken by the Rural Fire Service or the Fire Brigade and requires a special permit. It also takes considerable advance planning, particularly around residential areas,” said Lionel Smitka, Digga Australia’s Marketing Manager. With its ability to mulch the debris back into the soil for faster decomposition, the DiggaMulcher is also widely used for park and forestry trail maintenance works. “The process of mulching debris is achieved in two passes,”Lionel said. “The first, forward driven pass cuts and breaks down the material into small chips via four rows of teeth, with each row of teethpositioned at a90 degree angle to the next row. The teeth are designed to cut across the entire length of the rotor resulting in less drag and reduced horsepower consumption. With adjustable skid plates, the amount of hammer to ground impact during mulching operations can be reduced as required. 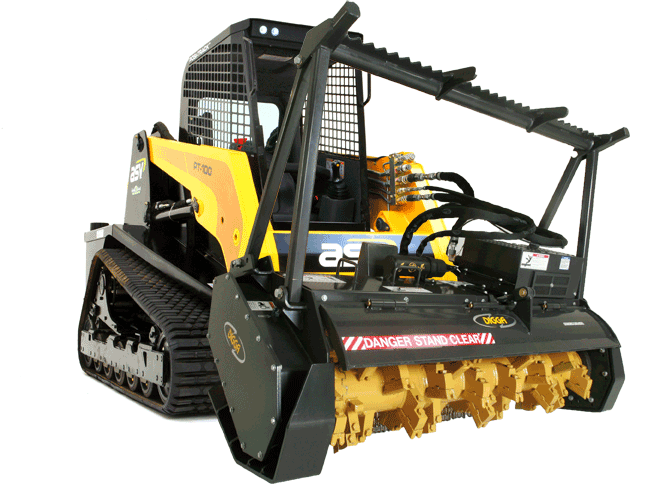 To prevent the skid steer or excavator overheating in heavy operations, the Mulcher features an integrated hydraulic oil system. “The Mulcher is actually tuned to the host machine on delivery to optimise the drum rotation at 2,000rpm. This increases production by preventing the downtime associated with overheating,” Lionel said. The Digga Mulcher is designed for long life, with a push type adaptor sleeve protecting the rotor shaft from coming loose in the event of a heavy shock or unintended axial load. “The Mulcher’s improved shaft and bearing design prevents bearing and rotor drift while keeping the lubricant in and the dirt out of the bearings – a common cause of bearing failure on other designs,” Lionel said. With three models in the Digga Mulcherrange, operators are able to choose the most suitable option for their equipment. “There is a model exclusively for use on skid steer loaders, one for excavators and one which is suitable for both,” Lionel said. The skid steer loader model is designed to attach via the toolbar/quick attach mechanism, while the excavator model comes with a mounting kit for easy installation.